Totally uneventful and barely interesting at all, this movie should have been so much better than it was. 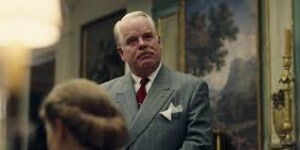 The Master is a mess of a movie. A film had tons of potential and somehow managed to not act on any of it. That’s because this movie that is supposedly about a cult and it’s followers and it’s leader turns out to really be about one misfit, violent, alcoholic, named Freddy Quell (Joaquin phoenix), who is lost in his life and joins up with the organization. Known as “the cause,” we end up seeing very little of what this movement is all about. We do not see anything of how it started or of why it has such momentum over average people. Freddy is a lousy representative of a character who would get involved with the cause, because he really is a mess, and most of the other people involved seem to be okay in their lives. Another big problem with the movie is that the leader of the cause, Lancaster Dodd (Phillip Seymour Hoffman), is not challenged enough. He is not put to the test, is barely questioned, and certainly does not explain enough. If this movie was about his character, and showed how this cause came about, it would have been a far better and more interesting film. 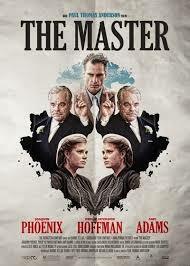 The Master is a Paul Thomas Anderson movie about a new religion-like cult. It’s about an organization where this one father figure, Lancaster Dodd (Phillip Seymour Hoffman) preaches about the ability to put people back into their past lives in order to work out problems. In addition, if the movie explored more of what this guy was preaching, or why people would believe it and follow him, than it would have been a much better film. If it showed us him being challenged and questioned in more than one scene, it would have been more interesting. Instead, it focuses on Freddie Quell, (Joaquin phoenix), an outsider, and that ends up being a huge mistake. Freddie Quell is a guy who is lost in his life. He was in the military, and now works at a clothing store, taking profile photographs of people. Freddy also has a temper and a bit of irrational hostility. He flips out on a customer for no reason at all, shoving lights in the man’s face until it becomes so hot that the man cannot take it anymore. This turns into a fistfight and a chase around the store, and to Freddy losing his job. It’s while Freddy is walking along the docks one day that he sees a huge party taking place on one of the larger boats and decides to just sneak on and join the fun. To his surprise, Freddy does not need to make up a story and lie about who he is and what he is doing there. Instead, these people are very welcoming, and happily take in the stranger, giving him food and a place to stay and being incredibly nice to him. From here, we get many conversations between Dodd and Freddy. Dodd preaches his religion, claiming that the reason why people are not at ease in their lives is because of problems that never got resolved in their past lives. Dodd says that he can put people in a trance and send them back into those past lives where they can work out the problems before returning to their current body and life. It all sounds like a bunch of hocus pocus fantasy, but these people do believe him and go with it. I think the movie shows that one of the reasons why people believe it is because the religion is so accepting. Showing the story from Freddy’s point of view definitely sets us up in that direction. It is a fish out of water story with Freddy being the outsider who takes us into this new world. However, there are two problems with that. First, Freddy is crazy. He is not rational or logical the way a character that we are meant to relate to should be. The other problem is that if we are using Freddy as the representative for all people who get involved with this religion, and if Freddy is twisted and broken with no job and no family, and no friends, then what about the rest of them. What about the person who does have a job, family, and friends? How does that person get involved with this? The movie does not really show us any of that. The only characters we really meet and spend time with in this film, other than Freddy, are characters that are somehow in Lancaster Dodd’s family. There is one guy who is his son, and another guy who is his son in law, having just married Dodd’s daughter. So, in no way are we given a picture of what the average person might see in this religion or how he or she would become involved with it. The big problem with the master is that nothing really happens. It is an incredibly slow and boring movie. Freddy hops on the boat and joins this cult and we get one interesting scene where the organization is challenged. It happens at a gathering where Dodd has put an elderly woman under hypnosis and she now comes out of it, and suddenly this man standing at the doorway starts questioning him. He asks how Dodd can claim that this hypnosis practice can cure forms of leukemia. Dodd gets angry that he is being challenged and ends up cursing with the man. That leads to Freddy and Dodd’s son in law, going to the man’s room, that night, and beating him up. That is pretty much the story with the excitement in this movie. It is just Freddy beating people up. It happens again when Dodd writes a new book and is promoting it and an old friend of the cause speaks to Freddy about it. This man is no longer supportive of Dodd and tells Freddy that the book is crap, and Freddy asks him to step outside. Once there, Freddy throws the man to the street and goes to work on him. None of this is as interesting as it sounds, because we’ve seen it before in this movie, a couple of times now. Freddy handles his frustrations with violence. That is all he knows how to do. Amy Adams is in the movie too, playing Dodd’s wife, only she really does not have much to do here. Like the two main stars, she is a great actor who is usually on top of her game, but in this movie, there is just nothing to work with. The casting could not have been perfect. Both Hoffman and phoenix were just right for their parts. However, their parts were written to be very weak. A much more interesting movie might have shown how Dodd came up with this religion and got the whole thing started. That could have been presented to us in flashbacks. It is interesting to note that the master was written and directed by Paul Thomas Anderson, simply because Anderson has proven repeatedly that he is a genius filmmaker. This is his movie that misfires. PT Anderson’s best movie was his breakout film, Boogie Nights. He made hard eight before that, which was a minor whimper compared with the tremendous of boogie nights. After that, Anderson continued to make interesting films like magnolia and punch drunken love. His next big success was working with Daniel Day Lewis for there will be blood. Anderson is not only a filmmaker, but also an artist. His movies delve into psychology. In many ways, the master had the potential to be similar to boogie nights, as the story of a family of misfits who the world had turned their backs on. People who had no lives outside of the organization and so were forced to become a family themselves. Only The Master did not go that route. It made all the wrong decisions to show us some of the dullest scenes imaginable. I’m sure there’s more to this picture than I could see on a first viewing, and that if I watched it again and again, each time I would understand what P.T. Anderson was going for a little more. Only I am not sure I ever want to spend the time to see this movie again.